After having produced one of the most powerful album trilogies in recent times – Five Suns (2003), Black Oni (2004) and Elixirs (2008) – in the past few years British outfit Guapo seemed to have dropped off the radar. Multi-instrumentalist Daniel O’Sullivan’s departure following the release of Elixirs (which had been recorded as a duo by O’Sullivan and drummer David J. Smith after the departure of bassist/guitarist Matt Thompson in 2005) brought about a lengthy hiatus and rumours of the band’s demise. 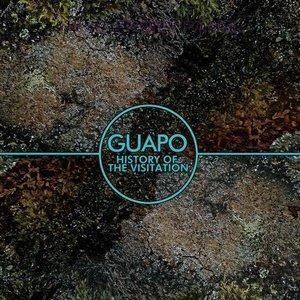 However, at the end of January 2013 Guapo resurfaced with a veritable bang – a brand-new studio album (their ninth), titled History of the Visitation, which also saw their return to the Cuneiform Records fold ten years after the career-defining Five Suns. Lineup changes are nothing new in Guapo’s chequered history, which began in the mid-Nineties with the release of three EPs, and then unfolded with various recordings and collaborations. In the intervening years, the trio configuration that had recorded Five Suns and Black Oni became a quartet with the addition of Iranian-born guitarist Kavus Torabi (of Cardiacs and Knifeworld fame, recently announced as the new guitarist for Gong) and bassist James Sedwards, while keyboardist Emmett Elvin (like Sedwards, also a member of fellow Cuneiform outfit Chrome Hoof) replaced O’Sullivan in time for the recording of History of the Visitation. Guapo are a textbook example of the mind-boggling variety to be found under the RIO/Avant umbrella – a label that, as is the case of bands such as miRthkon and Zevious, fits them only in part .Though the names of Magma and Univers Zéro often crop up in reviews of their material, those two seminal left-field bands are just a small part of Guapo’s musical identity in the second decade of the 21th century. The central role of David J. Smith (the only member left of the band’s original lineup) evokes comparisons with Christian Vander and Daniel Denis. However, Kavus Torabi’s pyrotechnic guitar skills lend to modern-day Guapo a keen, metal-like edge, while Emmett Elvin’s keyboards can weave heady, majestic textures in the best prog tradition, and James Sedwards’ rumbling bottom end often emerges from the fray to add another dimension to the uncompromisingly arcane, brooding nature of the band’s sound. The frequent repetition of lines and themes increases the hypnotic feel of the music in a fashion that brings to mind King Crimson and also some instances of post-rock. Recorded with the assistance of a number of guest musicians (including The Muffins’ Dave Newhouse), History of the Visitation clocks in at a mere 42 minutes. The first of the album’s three tracks is a 26-minute, 5-movement suite titled “The Pilman Radiant” – a title that, just like the album’s own title, references the cult Russian science-fiction novel Roadside Picnic, written by the brothers Arkady and Boris Strugatsky in 1971, on which Andrey Tarkovsky’s 1979 film Stalker is also based. Guapo’s moody yet hard-hitting music renders the intricate, visionary content of the story without any need for words, painting a picture that, in its own way, is as grandiose as any “classic” prog, though more viscerally intense. Somewhat more streamlined than the monumental Five Suns and Black Oni suites, “The Pilman Radiant” wins my personal prize as best “epic” of 2013. Its five movements are easily distinguishable, yet they form an organic whole. Introduced by the surging layers of keyboards, assorted sound effects and crashing drums of “Visitation” – later reprised by the short, appropriately spacey “Mosquito Mange” – the suite comes into its own with the eerie, quietly brooding beauty of the waltz-like “The Divine Vessel”, led by fluid electric piano and unexpectedly melodic guitar; pace and intensity increase, propelled by drums and bass, in the driving “Wriggling Magnet”, in which Elvin’s roaring organ complements Torabi’s gorgeous, rock-styled solo turn, then a grittier, metal-edged reprise of “The Divine Vessel” brings this exhilarating musical experience to a close. Strategically inserted between two much longer, more complex compositions, the 4-minute dark ambient piece of “Complex #7” skillfully piles up layers keyboards and assorted sound effects with the added contribution of reeds, creating a mounting sense of tension with the ominous feel of a horror-movie soundtrack. On the other hand, “Tremors From the Future” concentrates a dizzying variety of twists and turns in slightly over 11 minutes, its skewed melodic development powered by guitar and organ sparring and interweaving while drums and bass evoke the titular tremors with their steadily pulsing movement. The interest value of History of the Visitation gets a further boost from the presence of an almost 50-minute DVD featuring two of the band’s most iconic live performances from the past few years. The NEARfest 2006 performance of a somewhat shortened version of Five Suns, flawlessly shot in black and white, highlights Torabi’s flamboyant stage presence and boundless energy, as well as Smith’s role as the band’s rhythmic engine; while the more rudimentary quality of the video recorded the following year at the RIO festival does not detract at all from the power of the angular “King Lindorm” thanks to Udi Koomran’s top-notch mixing and mastering work. In spite of the band’s reputation for scaring away some of the more conservative prog fans – also on account of the notoriously loud volume of their performances – History of the Visitation is a relatively more listener-friendly proposition than Guapo’s previous albums. The higher melodic content and skillfully achieved balance between hard-driving sections and more low-key ones are likely to surprise people who would not ordinarily appreciate anything bearing a RIO/Avant tag. Indeed, there are moments of sheer beauty on History of the Visitation that offset the band’s trademark looming darkness and wall-of-sound heaviness. With its toweringly Gothic atmosphere conveyed through stunning musicianship, this is definitely one of the year’s landmark releases.